The Bartlesville Masonic Lodge at 610 NE Washington Blvd has served Masonic Bodies and the City of Bartlesville for over 90 years. For a majority of the 90 plus years the lodge was located at Fourth and Dewey in Downtown Bartlesville. Since the past is a prologue it is good to have a précis of the history of Freemasons in what is called Indian Territory and Bartlesville. The knowledge of having traveled from the end of civilization over a path properly lighted into an untested information age will better enable us to define a path into the future. In 1824 FortGibson and FortTowson became headquarters for Colonel Mathew Arbuckle, a Master Mason. Colonel Arbuckle, with advice from Pierre Choteau, a noted fur trader and Master Mason, became a commanding figure in every activity of the early Indian arrival into the area. Among the Masons who played important roles in this historic drama were John and William P. Ross Cherokee Chieftains: David Carter, Pushmataha, the famous Choctaw philosopher and patriot; Colonel Peter P. Pitchlyn, Choctaw Chief; Yahola, Creek leader; Sam Houston, adopted Cherokee. Cherokee Masons petitioned the grand Lodge of Arkansas for dispensation to open a Lodge in Tahlequah. The efforts of the brethren were so satisfactory that the grand Lodge of Arkansas issued a charter to Cherokee Lodge No. 21 on November 9, 1848. After the war between the states, three Lodges under the allegiance of the the Grand Lodge of Arkansas organized themselves into a Convention and the Grand Lodge of Indian Territory came into existence on Monday, October 5, 1874. On November 10, 189 The Grand Lodge of Oklahoma Territory began with the aid and assistance of the Grand Lodge of Indian Territory. The two Grand Bodies were formally united as the Grand Lodge of Oklahoma in 1909. James Butler became postmaster for the first post office in Northern Oklahoma about 1850.iii Carr, a merchant, agronomist and futurist, cut a millrace to power a gristmill for the grinding of corn on the north side of the Caney Rier in 1870, and sold the gristmill to Jacob Bartles in 1875. By 1877 Bartles, a merchant, businessman and modernist, built a home and store as the start of a community north of the CaneyRiver. Keeler and Johnstone, merchants, businessmen and entrepreneurs, built a competitive general merchandise store on the south side of the CaneyRiver in 1884, founded the first business on the site of the present Bartlesville and drilled the first commercial oil well in Oklahoma in 1897. The Town of Bartlesville was incorporated in 1897 as a city of the third class with a population of 200. The final plat for “Original Town of Bartlesville” Cherokee Nation, Indian Territory was approved in 1903. Pioneer citizens were members of the many branches of Masonry. Lodge membership was wide-spread covering Vinita, Nowata, Claremore, Tahlequah, Coffeyville, other states and countries, e.g., Tennessee, Georgia, WashingtonD.C. and Canada. The Town of Bartlesville located in Cherokee Nation; Indian Territory had no Masonic Lodge in 1900. The lack of a suitable meeting hall for the exclusive use of the lodge, as required by The Grand Lodge of Indian Territory. A General drought and an increase in oil activities which placed a strain on the available funds. A change in Federal Regulations relating to ownership of Cherokee lands. In early 1904 the Grand Lecturer of the Grand Lodge Ancient Free and Accepted Masons of Indian Territory came to Bartlesville. The local Masonic Group showed proficiency in a meeting at Nowata’s Sunset Lodge No. 57. Upon petition of 27 Bartlesville Masons, The Grand Lodge of Indian Territory issued a letter of dispensation, dated Atoka, Indian Territory, constituting Bartlesville Lodge into a Lodge of Free and Accepted Masons. Dispensation was granted by order of Wilson Otho Bruton, Esq., Worshipful Grand Master of Masons, Dated at Atoka, Indian Territory, April 13, 1905, and signed by Joseph S. Murrow, Grand Secretary. Officers named in the Dispensation were W.G. Bryson, Worshipful Master, Frank Bucher, Senior Warden, W.T. Berentz, Junior Warden. (So begins the transcript taken from the archives of the Bartlesville Masonic Lodge by Brother James F. Boggs, Acting Historian, as appointed by Roy W. Thorpe, Worshipful Master of Bartlesville Masonic Lodge No. 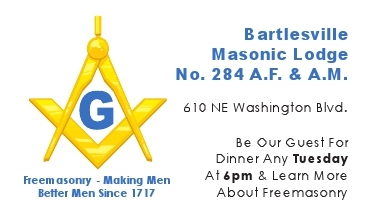 284, AF&AM and ending with year 1959) …In this year (1909) a new Charter was granted to Bartlesville Lodge No. 284 by the Most Worshipful Grand Lodge, AF&AM, of the State of Oklahoma, under date of February 11, 1909, and was in lieu of the old Charter issued to Bartlesville Lodge No. 160 AF&AM, by the Most Worshipful Grand Lodge of Indian Territory. Officers appointed by this Charter were Joseph John Curl, Worshipful Master, George Irvin VanDall, Senior Warden, and Herman Fred Cook, Junior Warden. Locating and building a MasonicTemple in Bartlesville is a challenge. The Temple must serve may Masonic Bodies and be adaptable for the future. The first MasonicTemple was in the old Eagle’s Hall, located at 113 1/2 East Third, and remained there until completion of the Wilhite, King and CurlBuilding on the southeast corner of Third and Johnstone Avenue. The third floor of this structure became the MasonicTemple in early 1906 and served such until 1919. However, purchase of Lot 1 of Block 38, in the business district of Bartlesville, site of the current MasonicTemple at Fourth and Dewey, was completed by August 27, 1907. In 1917 Dr. Howard Weber was authorized by the Lodge to raise funds for the building of a six-story building with offices on the first five floors and the Masonic Lodge on the sixth floor. The Empire gas and Fuel Company (later Cities Service Oil Company) committed to lease the basement and six floors upon completion of construction. When construction started in 1918 the plans were changed to build a nine-story building. The building was completed in 1919. In the 1970′s Cities Service Oil Company moved from Bartlesville. Bartlesville Lodge No. 284 sold the building to TRW and arranged to lease the ninth floor for Masonic Activities. Bartlesville Lodge No. 284 acquired property from Walter M. Sharp in August 1974 to prepare for the future. Due to increases each year in the cost of the Lodge at Fourth and Dewey and the age and upkeep of the ninth floor a decision was made in early 1999 to look for a new location for the Bartlesville Masonic Lodge. After looking at several properties it was determined, by the Lodge, that the location on Washington Blvd. Which was acquired by the Lodge in 1974 would be the best location. In the year 2000 construction was completed on the New Lodge building. i. History of FreeMasonry in Oklahoma, Masonic Home Print, Guthrie Oklahoma. ii. History of Washington County and Surrounding Area, Vol. 1 Pg. 81 & 85, The Bartlesville Historical Commission. iii. The First White Settlers in Washing County, By Joe H. Barber, Copyright 1968 by J.H.B. iv. Rev. Murrow in the Cherokee Nation, By Joe H. Barber, Copyright 1968 by J.H.B.